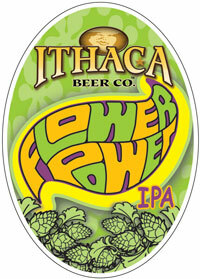 Ithaca Flower Power is a great (like, REALLY, REALLY GREAT) American IPA from the Finger Lakes region of New York. The name comes from the abundance of strong, fruity hops used to make the brew. Like many American IPAs, Flower Power has a crisp piney, citrusy taste and packs a serious hop wallop. But don’t take our word for it; check out the reviews on the link below. Seriously, stop reading this and look at that damn BeerAdvocate score! Enough said.